Charlie Hardie is a former under-the-table employee of the Philly police force before an incident altered his life and forced a drastic career change. Charlie is now a house sitter who agrees to sit on your couch, down beers and watch old movies why you’re off having a life somewhere else. Hardie takes a job watching a home when upon arrival, he’s attacked by well known actress/socialite, Lane Madden. Madden is spouting off conspiracy theories about “them”, an unknown group dubbed, “The Accident People” who eliminate higher-ups while constructing detailed alibis that make death appear accidental and plausible. The planned killing of Madden threw a wrench in their mission and now she’s on the run and inadvertently dragged Charlie into the situation. Can Charlie escape with his life or is he doomed to suffer Madden’s fate as well? 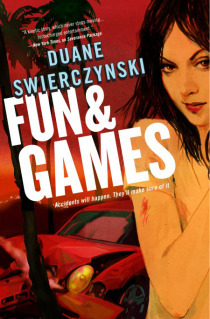 I really, really like Duane Swierczynski and he’s quickly becoming one of my favorite authors. His work is so gripping that he never fails to keep me interested throughout any of his novels. I’m not sure what he has in store for the next two Hardie stories but I really feel like this was strong enough to stand on it’s own. Hopefully he always had a trilogy in mind and based on the release/publication dates of the remaining installments, I assume that was always the case. While Hardie himself can seem sort of bland at times, the “Unkillable Chuck” angle that Swierczynski attaches to him creates a nice level of intrigue as well as making me want to know more about his past. Hopefully we’ll know more about him as the books move forward.